Oh yes forgot that one! Even though I took a photo of it and the Brother in Law also did not stop moaning about her being difficult to load! Thanks Derek,for your info.Also the 'Mistral'IMO number 9183788 spend some times on the Europort Route. Thanks Frits,for your comment ,on this former Wagenborg vessel. Stena have her on "bareboat" charter for 9 months I believe. "Somerset" and "Bore Bay" are now running the Harwich- Europort service having taken over from "Stena Scotia" and "Stena Foreunner" which have both gone round to the Irish Sea routes. "Misana" also spent some time on Europort route inbetween. 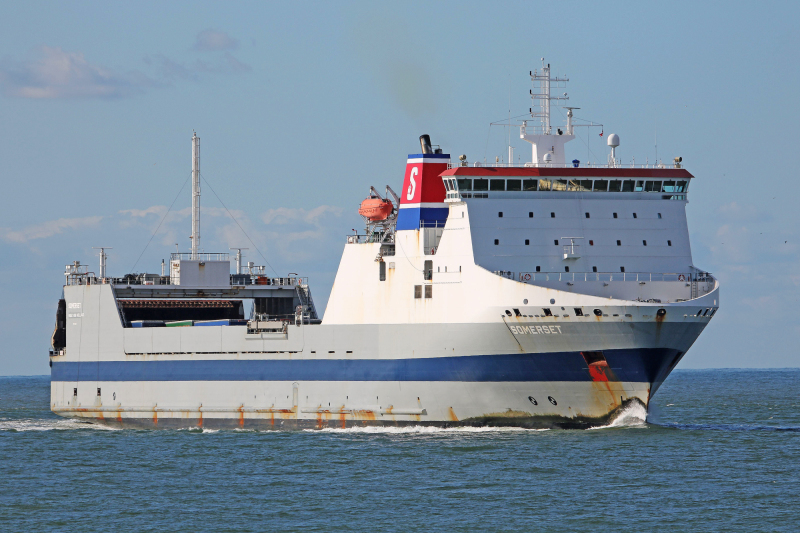 Now with Stena funnel, is this vessel a replacement for the two Cobelfret/Stena- ships, together with Bore Bay?